Winter in Hawaii means your coats and beanies remain stowed away in your travel bin, but what Oahu lacks in the sit-by-a-fireplace-and-drink-eggnog vibe the island makes up for with an abundance of other equally honorable holiday qualities, mainly that your social life won’t suffer because it’s too cold to wait for an Uber or Lyft outside. So embrace the warmth by filling your calendar with fun holiday events like watching Santa paddle through the ocean in an outrigger canoe or playing in the snow in 80-degree weather, and get ready to celebrate the holidays, island-style. If the thought of roasting a turkey is giving you anxiety, let this farm-to-table restaurant do all the work for you. Indulge in a three-course meal, starting with a cream of 'ulu (breadfruit) soup with green beans and mushrooms followed by organic, free-range, hormone-free turkey, served with grilled corn on the cob, and a savory stuffing waffle with your choice of starch. For dessert, finish with kabocha (Japanese pumpkin) pie topped with candied pecans and spiced goat cheese. As an added bonus, a special craft Bay Leaf Old Fashioned cocktail is available for an additional purchase on Thanksgiving only. The best part, though? No dishes. Contestants from Ru Paul’s Drag Race stop at Hawaii Theatre as a part of their official tour, entertaining with holiday classics from their chart-topping Christmas albums, with their third album to be released this month. Instead of sifting through pre-cut, mainland-grown trees this year, head down to the island’s Christmas tree farm, where you can skip through fields of a variety of pine trees until you find the perfect tree. A Helemano Farms worker will cut down the tree, and you can take home your fresh pine with the peace of mind that it won’t brown before Christmas. See the animated TV special A Charlie Brown Christmas come to life on stage at Diamond Head Theatre, and follow Charlie Brown as he directs a school holiday pageant and finds his Christmas spirit along the way. Those on your nice list are in for a treat because this annual holiday shopping event will help you find that perfect gift that mainstream retailers can’t provide -- all while supporting local artists and crafters. That's a win-win. A shaka-wielding Santa and Mrs. Claus hold down the fort at Honolulu Hale, marking Christmas time in Honolulu. On opening night, the Christmas tree lights up, followed by an electric light parade from Aala Park through downtown Honolulu, with food booths and decorated trees and wreaths on display. The Corridor of Lights remain on display until the new year, so there’s plenty of time to take Christmas selfies. Give your credit cards a break and temporarily pause the holiday shopping at Ka Makani Alii Shopping Center to treat your ears to a mini slack key guitar concert. More than 15 musicians might be playing for the crowd at any given time. OK, so maybe you can break out your winter wear for a few hours; the weather wizards in Kakaako have figured out a way to make 20 tons of snow stick in 80-degree weather. Get in on the snowball-fighting action before Mother Nature has her say. 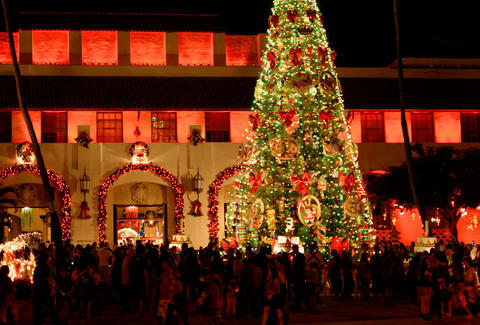 Gather some friends and hop aboard an open-air trolley for a breezy and unobstructed tour of the city’s festive light display. Caroling is optional. Note that the trolley doesn't run on Christmas Eve or Christmas Day. Floats, bands, community groups, dogs, and Santa Claus take to the streets to spread Christmas cheer as the annual parade marches from St. Louis High School/Chaminade University up Waialae Avenue to Koko Head Avenue. The parade officially lights the big metal conical Christmas tree atop Pu'u O Kaimuki (also known as Menehune Hill or Christmas Tree Park). Hawaiian musician, vocalist, songwriter, and dancer Kuana Kahele Torres hosts three nights of live music and hula dancing with special guest performers, including seven Miss Aloha Hula winners and the 2017 Miss and Master Keiki Hula from the Merrie Monarch Festival, the island's annual prestigious hula competition. Instead of sleeping in this weekend, put your hands to work with some basic lauhala weaving (weaving with hala leaves). Each second Saturday, the Hawaii State Art Museum offers free lauhala classes, but this week you can weave your own ornament to give to your mom, significant other, or add to your own collection. Materials are provided and you can drop in anytime. No chimneys in Hawaii, no problem, because Santa comes to the islands reindeer-free sailing through Waikiki Beach on an outrigger canoe, stopping to take pictures in the Outrigger hotel lobby. Take a holiday canoe ride, participate in a scavenger hunt, play in the “snow,” or just hang out, relax, and watch hula dancers accompany live musicians on the lush grounds on the island’s largest living museum. If you want to listen to the music from The Nutcracker without seeing ballet (or prefer to imagine sugar plums twirling in your head), then you’re in luck because the Mike Lewis Big Band and pianist Tommy James present their interpretation of jazz legend Duke Ellington’s Nutcracker Suite at Blue Note Hawaii. Grab a pair of sneakers and your ugly Christmas sweater because it’s time to put the sweat in sweater at the Make-A-Wish 4th Annual Jingle Rock Run where you'll jog through downtown for a foot tour of the Honolulu City Lights. The race isn’t timed, so you can press pause on your stopwatch and stop for pictures. After you’ve opened presents, put on your stretchy pants and treat yourself to a gluttonous buffet where you can get your fill of soup, salad, oysters, prime rib, suckling pig, fresh poke, eggnog creme brulee, and pumpkin crunch cake, and if you have energy after all that food shoveling, maybe snap photos with Santa. Spend the last few hours of the year letting Bill Maher, Bob Saget, and Reggie Brown tickle your funny bone. Just get your tickets early, because Maher’s show has sold out for the last six years. Leave 2017 in the dust and start the year at this beachside bar by snagging oceanfront views when the fireworks go off at midnight. General admission gets you into the kingdoms of RumFire, Helumoa Pool, Infinity Edge Pool, and the Edge of Waikiki. Admission into the Champagne room with private bars, communal lounges, and VIP bottle service for large groups are also available for an added fee. Journey to the 19th floor of the open-air nightclub for a bird’s-eye view of the Waikiki fireworks and celebrate the new year with hosted food, hosted Ketel One vodka cocktails, and Veuve Clicquot Champagne. Wear comfortable shoes because it’s standing room only. Table and bottle service is available for double the price. Toast the new year without the massive crowds and hop aboard the Star of Honoluu for fine dining, live entertainment and fireworks. Or opt for a casual cocktail aboard the Dolphin Star catamaran -- either way gets you ocean views of the fireworks, which is a not too shabby way to kick off 2018. Get blessed for the new year, Japanese-style, by visiting a Shinto or Buddhist temple for good luck. Visit Hawaii Kotohira Jinsha-Hawaii Dazaifu Tenmangu, eat good luck ozoni (mochi soup), listen to taiko drums, watch a Japanese lion dance, and read your omikuji (oracle). If you believe your fortune is bad luck, you can tie the paper to a tree on shrine grounds in hopes your omikuji will not come true. Summer Nakaishi is a freelance writer for Thrillist who usually asks Santa for a 70-degree Christmas but will settle for no vog, a stiff breeze, and an iced coffee.